Installing a window isn’t as simple as one might think in today’s construction industry. These days, there are certain codes and regulations that one must adhere to according the American Architectural Manufacturer’s Association published by the International Code Council. These codes are pretty much widespread throughout the United States (US) and several federal agencies. Many dealers that sell window material are aware of this International Code that’s being enforced throughout the industry. At the same time, there are different editions that are also circulating as updates occur. Stonexchange, a marble window sill manufacturer and wholesale distributor prides itself on staying on top of the latest window sill requirements. This is a top priority since we design our own marble window sills and manufacture engineered stone. We are obligated to know what the standard specifications are for window sills and doors thresholds in order to keep our warehouse in Miami fully stocked and ready to fill an order at a moment’s notice. It’s in our best interest as a business to cut our marble right the first time and not spend more time and man hours re-cutting marble leaving unwanted scraps behind, or worse cutting a marble window sill that’s too small. Older dwellings may get a pass when it comes to this sort of thing, but unless it’s a historical build, the moment you start the renovation process, you’ll quickly find that certain specifications must be met. If you’re a building contractor managing a construction company and you’re looking to stock a bulk amount of marble window sills, it’s imperative for your company’s financial sake that you keep a healthy stock of inventory on hand for any contracts that you’ve won a bid on. Every good contractor knows that timing is everything. Everyone involved in building a dwelling, whether it’s residential or commercial is on a tight time schedule. It’s absolutely crucial that everyone from the bricklayers, electricians, plumbers, painters, those who lay the tiles, and even the delivery of appliances—all must be put on a tight schedule. And if even one of these people divert from the schedule, it can cost you thousands of dollars. Say for instance, you’re expecting to lay the tile after the painter leaves. You lay your tile, and now it’s time to install your marble window sills only…you don’t have them! Sure you ordered them, but somehow there’s been some miscommunication where your tile supplier doesn’t have enough marble window sills in stock, so they have to order them—and that’s going to take 7-10 business days, but they can expedite it in 3 days. Still not good enough. You’re already scheduled to power wash the exterior of your house, and the rental equipment for that has already been contracted for only 24 hours. What that means for you is that you’re going to have to push back the power washing and possibly put other projects on hold until those marble window sills come in. Who knows when you’ll get that power washing equipment again? Perhaps another week or two? Things like this can set a well-planned construction project back costing you money and maybe even a client. In the construction industry, time is everything. Something that seems as insignificant as a short supply of window sills can snowball into a big problem. One of the ways to avoid unfortunate delays is to make sure you have all of your inventory on hand, including your marble window sills. In order to do that, you need to make sure that you have a reliable marble window sill supplier. If you’re installing marble flooring, you might think that the reasonable thing to do is order your marble window sills from the same supplier. However, if you can acquire your building materials at a cheaper price, it’s certainly worth looking into, don’t you think? Stonexchange specializes in supplying marble window sills in a variety of different color variations. Focusing on this niche makes them one of the potential leading natural stone distributors in the market. Builders know that they can stock their warehouse with the choicest cuts of marble window sills shipped from quarries from around the world, 10 different countries to be exact. Because marble stone comes in a vast variety of color variations, this might confuse buyers into deciding which kind should they should stock for future building projects. While neutral is always the best way to go, you have to realize that your competition is stocking that as well. Because we supply hundreds—thousands of building contractors, architects, designers, and retail owners and many of them tend to gravitate toward the Emperador Brown or the Crema Sahara Marfi for a lighter touch. So, we have an abundant supply of that in stock, which is a good thing! Our clients order these selections because that’s what appeals to buyers, and it’s usually for residential builds. Neutral tones serve as a blank canvas that helps potential buyers imagine their personal items in a space while keeping it warm and inviting. For commercial applications, the square footage tends to be a bit more spacious, so builders can afford to install some darker tones like the Black Granite or the Bardiglio Gray for a more robust masculine touch. You can take a look at all of the marble window sill options that Stonexchange has to offer here. Stonexchange: Supplying Your Window Sills Right Away! 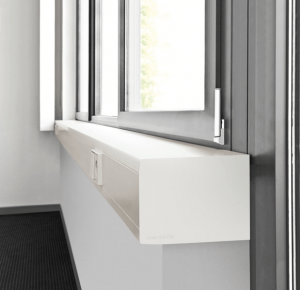 Stonexchange will supply you with all of the up-to-date standard size window sills available in today’s market. Because our company specializes in natural stone window sills and thresholds alone, there will never be a time when we’re out of stock. The only time when you have to ever wait for an order is if you place a custom window sill that has measurements outside of the standard specifications. Call our customer service department today for more inquires. We offer generous discounts for certain bulk orders. Contact us through our online form to find out exactly how much you can save! Our number is 305-731-2400.